Ruth’s story is sadly far more common in our modern times than it ever was. 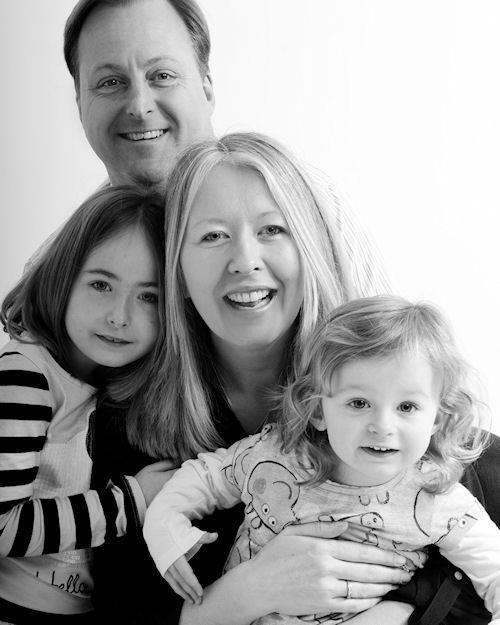 Ruth survived breast cancer and like so many others rethought her lifestyle and what she was putting onto her body. 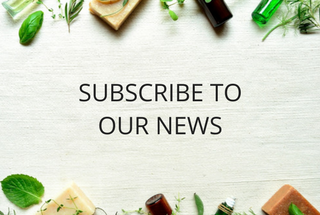 Whether you are someone who believes the research that suggests that parabens have been found in breast tumours or not, the bottom line is that what you put into and onto your body will over a period of time affect you. Particularly since having my own children and then losing my own mother to lung cancer 3 years ago, I have felt compelled to look at every aspect of my life to see if I can make small changes for the better. None of us are perfect, however those small changes accumulate and over time they matter. I therefore relate to people such as Ruth who have shaken up their life and made changes for the better. And from that shake up came some pretty great products to boot ! Ruth’s range is small but perfectly formed. Bath soaks, hand wash, soap and lip balms, all made with natural ingredients and fragranced with essential oils. I have fallen back in love with what I’d term as “old fashioned” or as others may describe it, traditional soap. I remember having it as a child when pump soaps weren’t even heard of. I’m showing my age now ! However, not all soaps are made equal and they vary considerably. 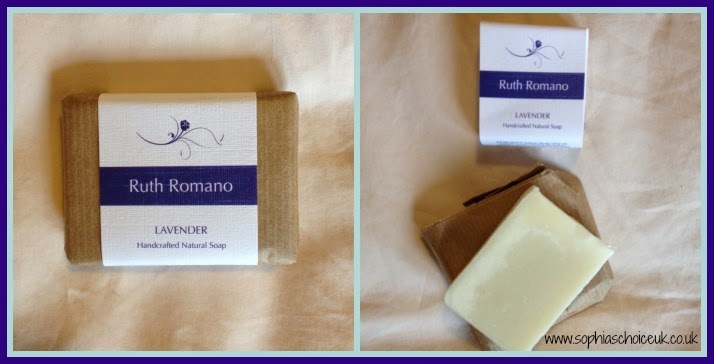 Ruth Romano’s Lavender Soap was exceptionally creamy. It lathered well and left my hands clean but not dry. The lavender fragrance was beautifully subtle and I was pleased it didn’t have any bits in it. My girls love nothing more than taking a soap apart with lavender flowers in it and messing up my lovely clean bathroom. Cheeky monkeys. The soap lasted ages and didn’t end up all soggy bottomed on my wooden soap dish – a big plus. This soap also won Silver in this year's Skins Matter Awards. The orange lip balm is delightful. It smells a touch like a chocolate orange – yum. Lip balms can be another product that varies so much. 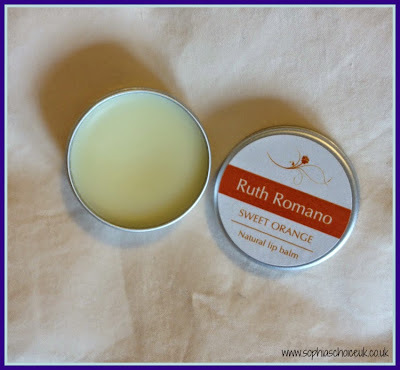 Ruth’s lip balms are firm but melt beautifully onto the lips. Perfect for keeping in your handbag or glove box in the car. 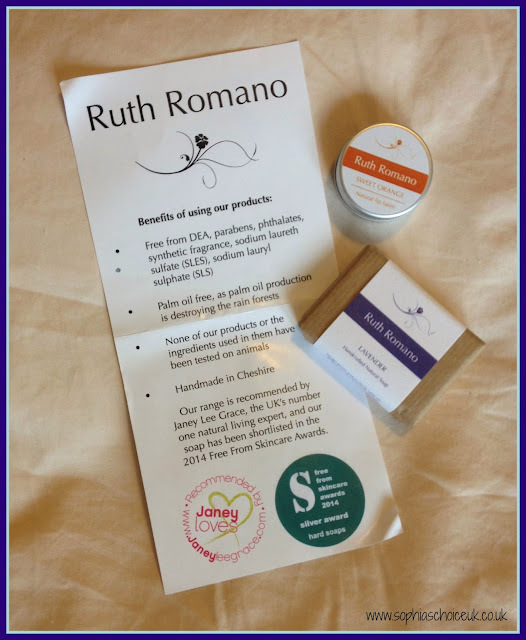 Having tried out these two products, I’m keen to try out Ruth’s dead sea bath soak. A relaxing soak sounds like a dream right now. Those moments are less frequent in our house these days but when I’m granted them I really make sure I indulge. The lemongrass bath soak sounds delightful. Perhaps I better start hinting to hubby for Christmas ! If you’d like to find out more about Ruth’s gorgeous products then pop across to her website. You can also connect with her on Facebook and Twitter. Disclaimer: PR sample given with regards to my boutique and possible inclusion on my blog. All opinions, thoughts and feelings are honest and my own.